When there is a problem with the spine, it can lead not only to severe back pain but also severe neck, shoulder, arm, and leg pain. A back pain specialist treats more than just back pain! Case in point: a condition called spinal stenosis. 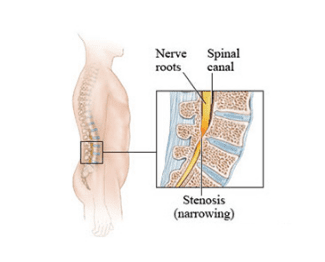 Spinal stenosis is a narrowing of the open spaces within the spine. As these gaps narrow, they exert pressure on the spinal cord and nerves, which affects other parts of the body. Spinal stenosis can affect the neck (cervical spine) or lower back (lumbar spine). Lumbar spinal stenosis usually causes severe lower back and leg pain (especially around the calf). In severe cases, people may experience trouble in maintaining their balance while standing and walking, and experience problems with their feet, bowel, and bladder. Gravity aggravates the symptoms of lumbar spinal stenosis, so sitting or leaning over often provides some relief. Ossification of the posterior longitudinal ligament (thickening of a normally flexible ligament in the spinal column). If you’re experiencing the symptoms of lumbar spinal stenosis, you’ll need to see a back specialist to be diagnosed. A back pain specialist will review your medical history and conduct a physical exam, and then conduct imaging tests (such as X-ray, magnetic resonance imaging, computerized axial tomography, myelogram, and bone scan) to accurately diagnose your condition and identify the best treatment approach. If a spine doctor confirms that you are suffering from lumbar spinal stenosis, he or she will devise a treatment plan that will involve seeing not just a spine specialist, but possibly an internist, general practitioner, rheumatologist, neurologist, orthopaedic surgeon, neurosurgeon, and/or physical therapist. Exercise and/or physical therapy to help strengthen abdominal and back muscles to stabilize the spine, maintain or improve range of motion, and increase endurance. Nonsteroidal anti-inflammatory medications such as ibuprofen, aspirin, and naproxen to reduce inflammation and relieve pain. Anesthetic and/or corticosteroid injections around the nerves. Lumbar brace or corset to provide support. Restricted or modified physical activity. While nonsurgical treatments temporarily relieve pain, they don’t always reverse the causes of lumbar spinal stenosis. Often, a back pain specialist will conclude that surgery is needed to alleviate the cause of lumbar spinal stenosis or prevent it from worsening. By the time lumbar spinal stenosis becomes debilitating (causing numbness or weakness that interferes with walking, impaired bowel or bladder function, or other neurological symptoms), a spine doctor likely will discuss the pros and cons of surgery with a patient. The “gold standard” surgical treatment option for lumbar spinal stenosis is called a decompression laminectomy. During this procedure, a spine doctor carefully removes bony spurs and accumulated bone masses in the spinal canal. This decreases pain-causing pressure on the nerves by providing room for the spinal cord and nerves to expand. When possible, a back pain specialist will conduct decompression laminectomy using minimally invasive techniques that result in less pain and a much shorter and easier recovery period. In more advanced cases (involving significant spinal deformity or instability or advanced arthritis), a back specialist may opt to perform a spinal fusion surgery to connect two or more vertebrae to better support the spine. If you’re experiencing back pain, call Dr. Jones to schedule an appointment today.